I set off for two weeks in Lier bright and early on Wednesday 14th March, opting to take the Eurotunnel rather than the ferry to allow myself an extra hour in bed and to avoid the anxiety of being delayed by windy conditions. My extra worry on this trip, not having been to Belgium since they introduced their new road tax system was getting an On Board Unit before entering Belgium. Luckily Nattie Biderman had given me excellent instructions as the service point is literally in an unsigned lay-by just before the border. I entered all my details, scanned my documents (having run back to the lorry to get them) and put in my credit card - all for the machine to tell me it had technical problems!! On I went with a photo of the malfunctioning machine and my receipt. Luckily Nattie spotted me in the lay-by and we were able to travel in convoy with Shane, Georgia Tame & David & Louise Simpson's horses for most of the rest of the journey, although we did actually all manage to arrive separately within 10 minutes of one another - the wonders of the sat-nav! What a treat to find the stables had already had a clean basic bed in them, so the horses were almost instantly comfortable, and I could quickly get them water, hay and lunch. I got everything organised, the lorry hooked up to the electricity and then gave both horses a good ride round before the rather late trot-up at 8.00 pm. A little chaotic but they both trotted up well and we declared for the next day. We woke up to pouring rain - the weather was to be one of the most remarkable things about this show. I jumped Emma in the 1.30 in the CSI2* which she happily hopped round for a low placing so we decided to go straight to the 1.40 the next day. Kvint also jumped well in the CSI1* 1.20 which a little spook at a flag costing him a clear round. Friday was seriously cold and rather snowy and Emma jumped a good round in the 1.40 for a single pole, but she made it feel easy. Kvint then jumped a lovely clear in the 1.20. My horses didn't jump on Saturday so they were nice and fresh for Sunday. It was -7 overnight on Saturday and very snowy on Sunday morning. The show were incredible, they put the start of the classes back an hour, harrowed the rings, salted them, left them for an hour and then harrowed them again, and the going was perfect. Emma jumped well for a low placing in the 1.35/1.40 final and Kvint just had four faults in the CSI1* Grand Prix, but jumped well. Both horses were at their first international show since November, with just two shows at Felbridge and two training sessions so I was thrilled to have them in such good order. When we woke up on Monday morning it was still absolutely freezing, and with very few horses keeping the stables warm all the water was frozen. Luckily we could ride in the indoor school, although the heating was turned off once the first show finished. I hacked the horses out on Tuesday - I don't think this is a very Belgian activity as the cars I met didn't slow down even the tiniest bit - obviously horses are not part of the Belgian highway code! Georgia, Rosie and Emmie helped me give a Kvint a quick jump on Wednesday in case he had forgotten what he had come for, and I worked Emma on the flat. She was so wildly excited to be at a show that I resorted to flatting her in a pelham after she nearly succeeded in exiting the indoor school early in the week. Sadly my electric radiator in the lorry decided being on 24/7 was all too much and packed up completely for the second week, necessitating sleeping in a huge number of layers, socks and slippers and two hot water bottles. Luckily Dereck, the amazing stable manager, managed to get the electricity working so that I could still boil the kettle, shower and watch Sons of Anarchy. The second show started with Kvint stepping up to the CSI2* and tackling his first 1.30. The course was big and square, but very fair and he was a little star jumping a double clear. I then jumped Emma in the 1.40 where she was a little bit wild and strong for two poles. Kvint jumped well in the 1.30, a little bit green at this level, but improving all the time. Emma then jumped a great round in the 1.40 speed to be placed. 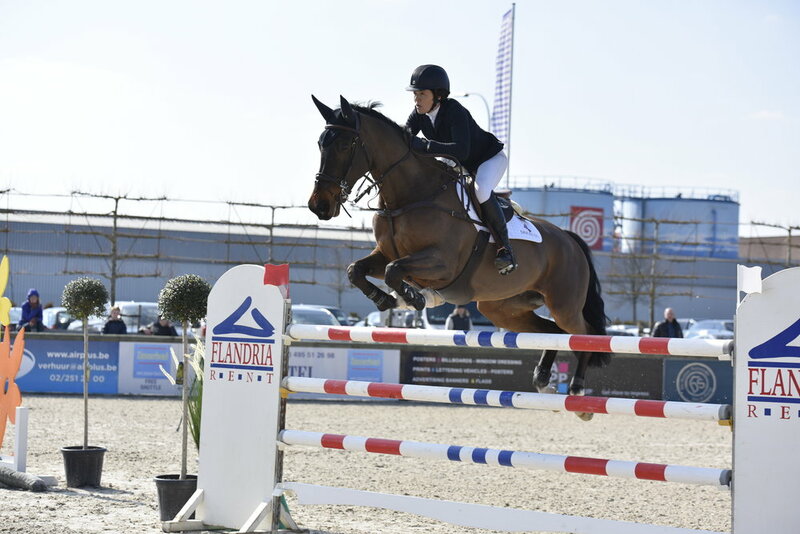 I then made the decision to jump Emma in the 1.45 ranking class on Saturday, and to jump Kvint in his last 1.30 so that we could go home on Sunday. Kvint jumped a lovely confident round, but just felt a bit tired when he had two uncharacteristic poles behind. I then walked the course for Emma - which was enormous and quite technical. She warmed up really well, but really ran me to the second fence, taking out a stride to a massive oxer. We reorganised ourselves and jumped the next four fences neatly and easily, but I decided that it probably wasn't the day to tackle the combination. I actually feel encouraged that she jumps these fences so easily now, and I need to be more confident about making her stick to my plan, give her more leg on take-off to give her confidence and we will soon be making this feel as easy as the 1.40's do now. I got to grips with the packing up before going out for a lovely supper at Pizza Express with David & Louise Simpson, Georgia, Ludo Langton, Emmie Axelson and Lori Hanan. On Sunday morning I trundled home, luckily leaving enough time to get lost twice - a good, if unscheduled tour of Ghent - I would certainly be keen to have another look from a more suitable vehicle, and to get stuck in traffic near Antwerp. I was home by 5.30 which was lovely, time to settle the horses in, have a wonderful bath and a trip to the pub, before a night in my own bed - bliss! 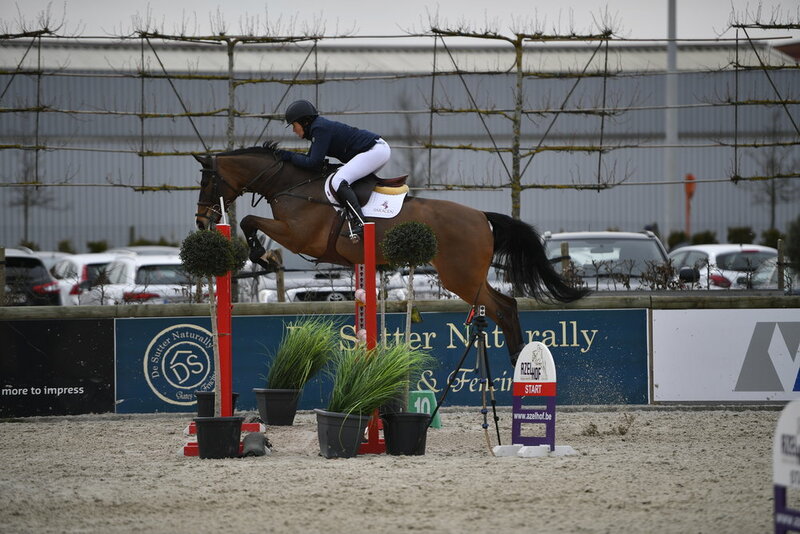 The weather made Lier a tough show, but the organisers were amazing, and it was absolutely great to be back out there with both horses stepping up and feeling great. I was wondering whether my enthusiasm for the job was still there, but it certainly is. As always every show is made more enjoyable by good company. It was great to have Shane at the show for the first week, always good company and perfect to have his expert help to set us off in the right direction. It was lovely to have Georgia and Rosie at the show, and with Emmie they were a brilliant help in the second week. Louise & David, Ludo, Lori and Winston were also great company and Ludo provided a brilliant sound track to the show. After the traumas of Emma's colic at Christmas, and then being ill again in February I am so grateful and relieved that she even got to the show, let alone jumped so well, and that she seems in flying form now we are home. I hope her health problems have settle down now, and many, many thanks to Cinder Hill Equine Clinic, Sussex Equine Hospital and Casserley & Sons, as well as Steff and Camilla who keep the horses fit and well. Also many thanks to Saracen Feeds for many years of feeding my horses and to MacWet Gloves - I love their gloves, and Lier was certainly a severe test of gloves that are great in all weathers. Many, many thanks to Jess and Pippa at Stride Management for their support. It is so lovely to be home, and at least we had one day of Spring on Monday. Mark, Steff and Camilla have done a brilliant job in my absence. Askeaton was full of enthusiasm for lunging on Monday, but was very good to get back on, and we have had great fun teaching her how to jump the banks and ditches in the forest this week. She will go to Felbridge on Monday and full speed ahead for her now.